Plastic Logic has decided that making a general eBook reader will simply not cut it anymore and they are quite right in thinking that too. 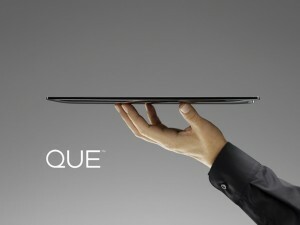 So they have announced that their eBook reader, called QUE, will be the world’s first “proReader”. What that they mean by that is what many company’s mean when they proudly mention attach the ‘pro’ prefix to their products — it’s meant for business. So what does it have that the Kindle or the Nook doesn’t? Well, the details are scanty on this one because the company is not letting things out of the bag yet but we do know that it will support multiple file formats that are usually required by business users. So it will be able to read (and display) PDF, PowerPoint, Word and Excel format — yes, they actually deliver on what they are promising. I mean at least where proper business format file support is concerned. The company also promises a user interface that is as intuitive as “paper and ink”. Now that’s a tall claim but for a device with the largest touchscreen available in the market, it would be a shame for it not to have a great touch based UI. So let’s hope for the best. Plastif Logic is going to compete directly with the Kindle readers with the QUE and a store that will be powered by Barnes and Noble. The QUE measures 8.5”x11.6” and is apparently just 1/3 of an inch thick. Now that sounds good. However, we will have to see this device to know exactly how good it is in person. A lot of things sound brilliant on paper but turn to be huge disappointments in person.